It is a glorious summer's day. The skies are a perfect blue and, in the humidity, the gentle rustle of a breeze in the trees is a welcome sound. Yet in this place there is an unmistakable stillness: a deep solemnity. For this is August in Hiroshima, Japan. Some place names are forever etched into the world's collective consciousness, and this has to be one of the foremost among them. It could well have been on a day like this that Hiroshima had notoriety thrust upon it, because it was on August 6, 1945, that the first atomic bomb to be used in warfare was dropped and detonated, roughly over the spot where I was now standing. Being in a place of historical note gives you a tangible feel of the past. 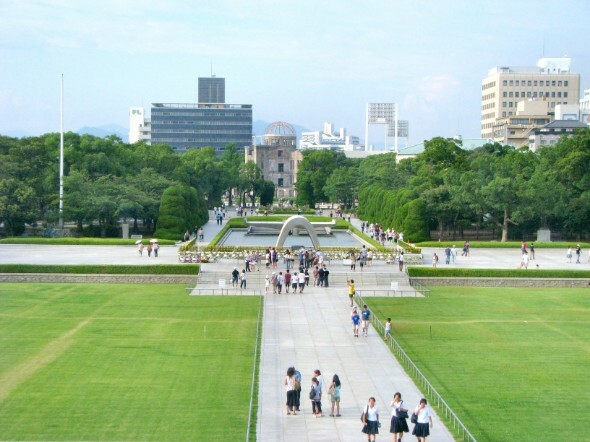 In Hiroshima it is the atmosphere as much as the local sights that gives you the impression that you can almost reach out to history. Sitting on a bench in the immaculately kept Peace Memorial Park, watching the groups of visiting schoolchildren come and go, I could not suppress visions of how it must have been here after the USAAF B-29 'Enola Gay' dropped her load. Wreaths and single-stemmed flowers adorn the simple but tasteful cenotaph, which forms the focal point of the park, each one delicately placed in exactly the correct place. Nearby, an eternal flame, the Flame of Peace, burns brightly, even in the summer sun. Everything here is about peace. This is hardly surprising, given the trauma of history in this place. When the 'Enola Gay' dropped the bomb on Hiroshima, the after-effects of the explosion were uncertain. Some forecasts predicted that nothing would be able to grow on the land for years afterwards. As it is, the Peace Memorial Park, which now occupies the area that was seared by the worst of the atomic blast, feels like a sanctuary of life amid the bustle of a renewed and bustling city. On the edge of the Peace Memorial Park, next to the Motoyasu-gawa River, is the A-Bomb Dome. Before the blast, it was the Hiroshima Prefectural Industrial Promotion Hall. Now, as a result being the building closest to the hypocenter of the explosion that survived even partially intact, the dome is a UNESCO World Heritage Site, dedicated to the memory of the casualties of the bombing. 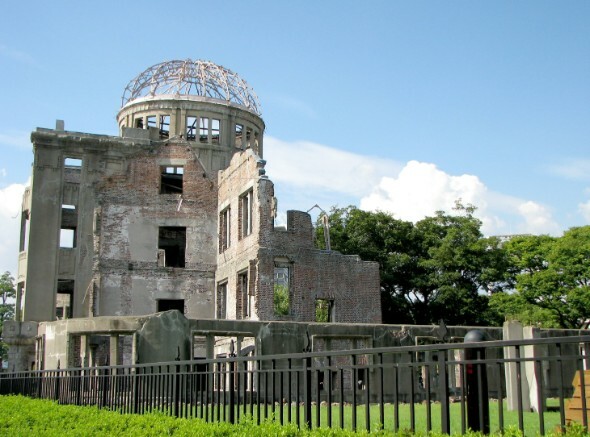 Given that an estimated 69% of Hiroshima's buildings were destroyed on that August day, the significance attached to the shattered remains is understandable. A short walk from the A-Bomb Dome stands the Children‟s Peace Monument, another of the many memorials in the park. Here, after seeing photographs of the area before and after August 6, I begin to get a sense of the scale of human suffering involved. I learn about Sadako Sasaki, who died of leukemia that took hold ten years after the bombing that exposed her to the fateful radiation when she was 2 years old. She folded nearly a thousand origami cranes in the hope that this might cure her. There was no air-raid alert at the time that the bomb, called 'Little Boy', was dropped, because the authorities believed the three planes overhead that morning constituted a reconnaissance mission. The explosion caught Hiroshima, and the rest of Japan, unawares. The Hiroshima Peace Memorial Museum itself is an unremarkable concrete structure at the south end of the park. I do not get more than half way around. The displays are gripping, but more than I can take. The immediate effects of the blast killed approximately 70,000 people, and estimates put bombing-related casualties by the end of 1945 at between 90,000 and 166,000. The museum has plenty of stories to tell, and a great store of relics with which to illustrate them. A large number of youngsters had been working in the city on the day of the bombing, building fire-breakers as a defense against traditional bombing. Many of these young victims had survived the intense atomic fireball with severe burns, and struggled home only to pass away days later. There is a lump in my throat as I pass the scorched child's tricycle and the wristwatch melted to a stop at the time of the explosion. As I pass the display cases containing fragments of victims' hair and fingernails, I feel the need to escape. Even knowing the debate on the necessity to end the war this way in the context of 1945, the consequences as displayed are raw and shocking in the deepest sense. It is easy to feel why Hiroshima has become the voice for world peace that it has, and why the city calls for the abolition of all nuclear weapons. On the outskirts of Hiroshima, a much different experience awaits. 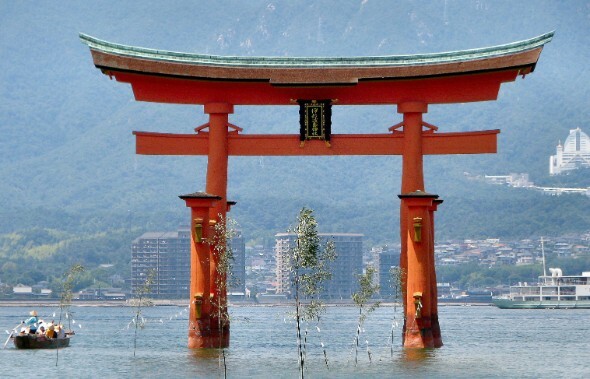 A short ferry ride from the mainland is the island of Miyajima, also known as Itsukushima. Approaching the verdant slopes from the water, it is already possible to breathe the serenity of this place, another UNESCO World Heritage Site. The shrine, the gate, and the five-storey pagoda might be bright red, but they nevertheless seem at ease in the natural surroundings. With good reason, this place is known as “one of Japan‟s three most scenic spots”. I do the tourist thing. Even with the large number of visitors around, it is a pleasure to stroll by the water and let the peace around the Itsukushima Shrine calm the heart. Life here seems sedate, which is just as well in the intense August sunshine. Furthermore, there is food for the body as well as the soul, with the local shellfish taking pride of place at pretty much every restaurant that I pass. The Japanese habit of decorating establishments with models of the food on offer made lunch easy even with my limited grasp of kanji. There was no trouble finding a free table and air-conditioning, and it was time to kick back with a plate of shrimp and a flask of sake. With a full belly and a lightened soul and lighter head, I wander back along the shoreline. Here, I feel the peace of ages. The Miyajima fishermen are doing their thing, as they must have done for years. Sometimes I pass a local lady in a kimono, carrying a parasol. The traditional clothing, I guess, must be much more comfortable than jeans in this weather. I had come to Hiroshima for the day from my base in Kyoto. That city, the beautiful cultural jewel at the heart of Japan, had also been on the shortlist of targets for the atomic bombing in 1945.